Universal’s biggest film franchise has hit number six with more than $1.5 billion in previous sales. And it looks like this new sequel/prequel will even push that amount further into another billion, despite its awful dialogue and numerous over-the-top, zany action sequences, which seems to make the audience laugh more often than cause suspense. That being said, this film does deliver what the audience has wanted since the first film. That is all of the original actors are back this time, which includes Michelle Rodriguez. I have no doubt this will score big at the box office. At least Universal seems to think so, as they have already greenlit part 7, which will be released next July and promises more stars and bigger action. Director Justin Lin and writer Chris Morgan have immersed themselves in this fuel injected world for the last four films and have not let up. It has to be difficult coming up with different and fresh situations for these characters to dive into movie after movie. Luckily for us, Lin and Morgan do a decent job here with not making us feel like we’re watching the same thing over and over. This time around, instead of the heavy amount of gun violence, we receive a healthy dose of fight choreography including MMA style, wrestling, and Tai martial arts. And if it wasn’t enough for the gang to race and chase exotic cars, Lin adds a giant military tank and large cargo aircraft to the mix. But with Vin Diesel, Paul Walker, and Dwayne Johnson all working together this time, there isn’t anything they can’t do, no matter how far-fetched the situation is. As we have come to know these characters over the past twelve years, we know they come from modest means with a big criminal history. However, from the last film, we saw them score a $100 million, which led all of them to live lavish lives around the world. That is until Hobbs (Johnson) shows up at Dom’s (Diesel) new place on some remote island and asks to make a deal. The deal is to help capture a criminal in return that he and his friends are all pardoned. The movie starts out very quickly with the entire group coming back together for this job including Roman (Tyrese Gibson), Tej (Ludacris), Han (Sung Kang), and Gisele (Gal Gadot). The bad guy they’re after is a British terrorist who goes by Shaw (Luke Evans), who is nearing his goal of acquiring a weapon that can destroy an entire country and eventually the planet. The gang, along with Hobbs and his partner Riley (Gina Carano), have their first encounter with Shaw as they chase him through the streets of London. They all have nice BMW’s this time around and Shaw is driving a custom built reinforced Formula 1 race car that seems to be capable of doing everything the Batmobile can. A few chases later lead to the climax of the film with a tank and a cargo plane that should appease the masses. The action itself is not executed well. 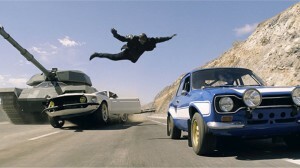 The chase sequences and bigger action scenes are choppy, too quick, and are not set up well. There wasn’t one time where I thought the cars were traveling faster than the speed limit due to the poor angles and fast cuts. On the other hand, the martial arts fighting was far superior than any of the car sequences as I could feel every hit and fall that was landed. It was brutal, but not bloody. I hope for part 7, that there is more of this fight choreography, because it definitely works. Meanwhile, the sub plot of the story follows Letty’s (Rodriguez) return to the series. Last time we saw her, she was thought dead, but that’s not the case here. She survived and is part of Shaw’s team. She also has no memory of her past life or friends. This gives Dom and his crew the passion to take this mission and take down Shaw, which ultimately sets up Letty for future sequels. ‘Fast & Furious 6‘ is a ridiculous action spectacle that will garner more chuckles and applause for fan favorites, than delivering genuine thrills. The acting is at time atrocious and the dialogue is just below that, but hey, this is a movie about cool cars and violence, which it delivers in loads in its 133 minute silly, yet fun run-time. Don’t forget to stay seated during the credits as we get a special sneak into the 7th installment that shows a big action icon joining the franchise. This entry was posted on Thursday, May 23rd, 2013 at 11:06 am	and is filed under Film, News. You can follow any responses to this entry through the RSS 2.0 feed. You can skip to the end and leave a response. Pinging is currently not allowed. I’ve tired of this series since Tokyo Drift. Though it’s interesting plot involving Tokyo Drift seem pretty good which sets up the 7th & i hope that will close out this series. But Fast 6 is just passable if best. I mean, it’s the 6th film in a franchise that is about fast cars, muscles, and violence. It does the job in being over-the-top ridiculous. But it is fun. « Film Review: ‘The Hangover III’!! !